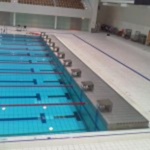 Mobile equipment for swimming pools allows you to adjust the characteristics of your pool to diversify its use and adapt it to different clienteles, sports, activities and age ranges. This way, you gain most profit from your pool by multiplying its usages. These mobile equipment respond to the requirements of standard EN 13451.11. 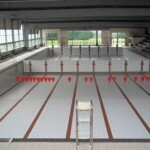 Mobile floors allow you to adjust the depth of your pool. In a minimal amount of time you can change its use from sports training and competitive swimming, to baby and toddler swimming courses, to aquaerobics sessions and aquabikes. 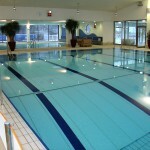 When the pool is not in use, the floor can be raised above the water to be level with the pool side and quays to form one continuous hall floor. This can serve many purposes, including as a thermal cover helping guard the water from excessive temperature loss and freezing. Mobile partitions/walls allow the partitioning of pool space to form separate zones allowing for multiple activities and functions. Mobile quays allow you to define the standard distance (governed by international and national sporting instances) for set distance pool lengths.